Well of Souls Forums - View topic - Page 104 discussion. On the quick page post, it actually follows the pattern, takes a (often long)while to get the new 3d scene made and then a bunch of pages featuring that scene in rather rapid succession....and then back to waiting for the next 3d scene to be finished, so we will probably enjoy a new page every two weeks or so for the next couple of months. all these updates has me excited. 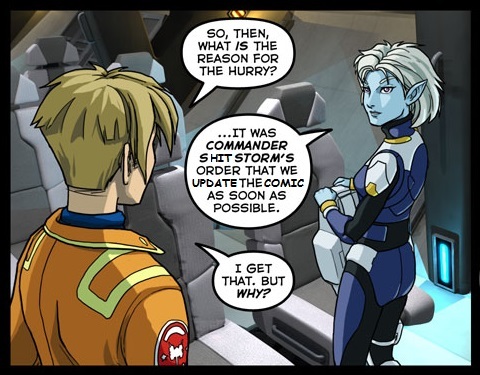 The background fluff have info about Talon (former fighter pilot) turned shuttle pilot so I guess she will be flying them. Also Ashrain is the only ship commander beside Stillstorm that are mentioned there. Why is that and why does she alone wear an amplifier on her head? My guess she are not done with this story yet. Ashrain is related to the Emperor and is likely to be important to the story later. It's also possible that Beryl's expression is due to what she was about to say. Saying something like that in earshot of Tempo would likely be a faux pas, regardless of whether or not Tempo is in Stillstorm's good graces. It might also be that Tempo wants to be the one to expose Alex as an Umiak infiltrator, preferably in front of as large an audience as possible, to maximize the effect of discrediting the idea that Loroi are somehow not truly the inheritors of the Soia legacy. Kinda rough having to deal with a race that can think at each other. Can't be sure what you aren't seeing. hehe I love this . . . tempo is also getting out of firestorm way too. Plus this little trip will provide more opportunities for tempo to learn about humanity and what they may offer to the Loroi. Well... hopefully Beryl won't be thrown off-kiltered by having Tempo as an additional part of Alec's entourage of escorts ..
Ah Beryl's face, it's like a half dozen plans went to crap the second she saw Tempo. I don't know.. Tempo strikes me as the type ...who likes to watch! hehe! I know I'm a bad-boy! Coming from a culture where words really are weapons, you have to wonder about someone who is so proficient with them. It would be pretty disappointing to have Tempo show up and probably take away all of your conversation time with a friendly alien. It's a long trip... who are you going to talk to - Fireblade? Tragic! Oh i bet fireball is awesome with Sanzai. in words not so much. Oh sure she I probably a strict military discipline, but those kind can also be the funest when not on duty. Beryl: "Fireblade, it is good to see you." Fireblade: "Whether we see each other or not makes no difference in the cosmic scheme of things. We are all but motes of dust caught in an uncaring sea of time and space." Beryl: "Ookay. I'm just going to do some science over here." Registered just to share my joy of seeing another page , that remind me how much i love this comic. having telepaths in a comic is a guaratee that i will pay attention to their faces, and beryl's was priceless! Sounds legit to me. It does sound better than sanzais. Sigh... I guess beryl just lost her long awaited chance to have a non-monitored and open-minded discussion about humaniti with alex. Just wondering if Tempo's show-up was part of the comic outline all along, or a recent change in the script. I doubt it was a change. I guess Tempo masterminded her own exile from Tempest as soon as she got a report of what Alex looked like. She is an intelligence office, skilled in wrangling information out of people and make them do her budding, in a way that they actually thought it was their own idea. Tempo are the kind of person you attach to your embassy in a foreign nation to recruit spies for your great nation. She made Stillstorm exile her. Long-planned, not a recent change. man im all excited about all these updates. Further proof that the Holy Trinity of FBT is worthy of worship; for who else can guide the mind of God onto the righteous path?